For the past several years, some fringe lawmakers have introduced one bill after another designed to give a “license to discriminate” against LGBT Georgians under the guise of protecting religious freedom. We’ve defeated every attempt to codify discrimination into law. But defeating bad bills isn’t enough. Until lawmakers pass a statewide non-discrimination law, LGBT Georgians will continue to face unfair treatment and harm. Georgia is one of five states that don’t have a civil rights law protecting people from discrimination in public spaces. 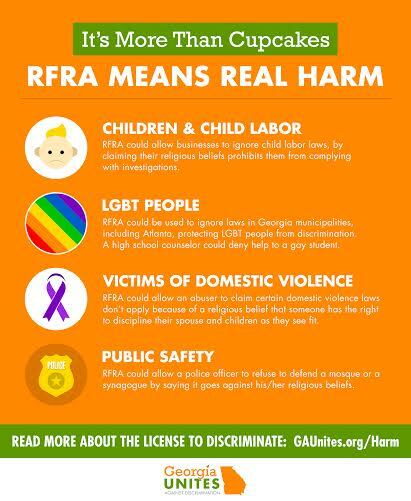 Explicit non-discrimination protections would make Georgia an even better place to live and raise a family—regardless of one’s faith, ethnicity, sexual orientation, gender identity or military status. 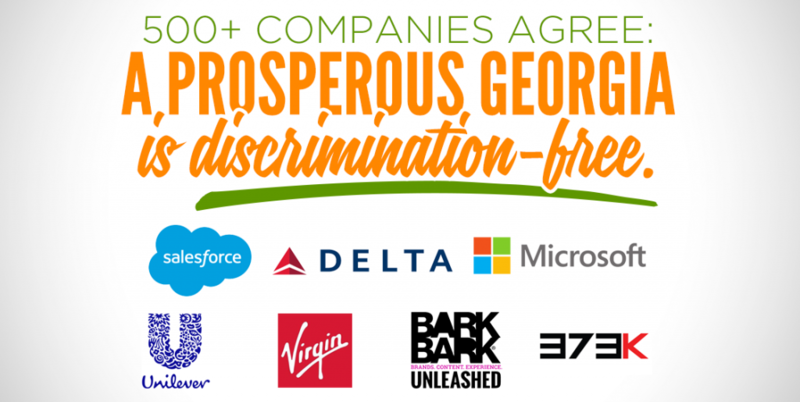 Hundreds of businesses have joined Georgia Prospers, a coalition dedicated to affirming non-discrimination. Many major brands and employers already have company policies that protect LGBT employees from discrimination. And two-thirds (65 percent) support passing a law that would protect LGBT people from discrimination in employment, housing and public accommodations, which are places like restaurants and shops. Non-discrimination protections ensure the fair and equal treatment of people under the law. It’s time to talk about comprehensive protections that extend to all Georgians—including those who are LGBT. The freedom of religion is one of our most fundamental rights. It’s protected by the first amendments to the U.S. Constitution and Georgia’s State Constitution, and it’s not up for debate. That’s why more than 300 faith leaders have spoken out against harmful religious exemptions bills, legislation that attempts to give “license to discriminate” under the guise of protecting religious freedom. Governor Nathan Deal stood with those faith leaders, hundreds of businesses, and thousands of grassroots supporters when he vetoed HB 757, a dangerously broad religious exemptions bill that would have allowed taxpayer-funded organizations to deny services and employment to LGBT people and many others. But a small but vocal minority of Georgia legislators are still determined to write anti-LGBT discrimination into state law, so we have to be vigilant. 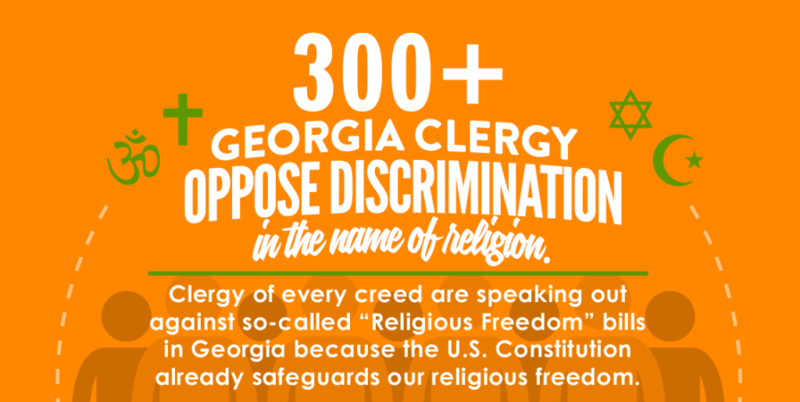 More than 500 businesses have taken a stand against discriminatory religious exemptions bills. But there’s another type of legislation taking hold in the states: Bills targeting transgender people specifically. In the same week that Governor Deal vetoed HB 757, North Carolina Governor Pat McCrory signed NC House Bill 2—one of the most egregiously anti-transgender bills in the country, which prohibits transgender people from using public restrooms that align with their gender identity—into law. Afterward, North Carolina lost a half-billion dollars in canceled investments, conventions, tourism business, and entertainment events from the ACC Super Bowl to a Bruce Springsteen concert—all as a direct result of discriminatory HB 2. Lawmakers should not be wasting taxpayer dollars trying to pass legislation that will result in nationwide boycotts. 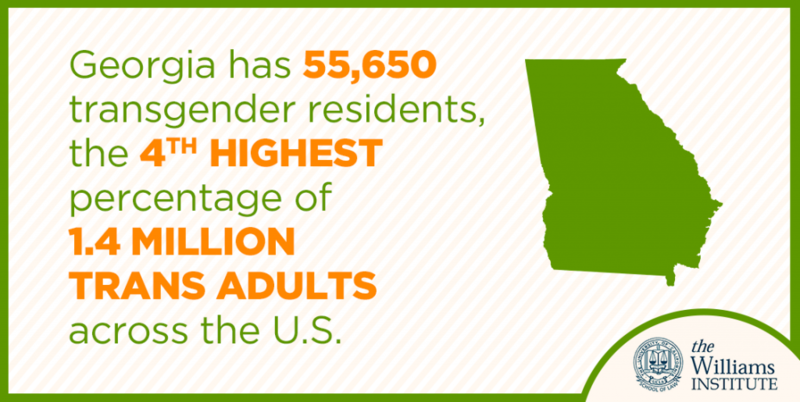 Lawmakers should be working to build Georgia’s economy and protect all hardworking Georgians by passing an LGBT-inclusive civil rights bill. Click here to send a message now.